We’re not going to get into the difference between a paper-based test (PBT) and a computer-based test (CBT) here, except to say that if parents have made the decision to opt out, they should know that opting out of one is different from opting out of the other. You’ll need to know which your child will have so you can help your child to opt out successfully. It’s not complicated, but there is a difference. 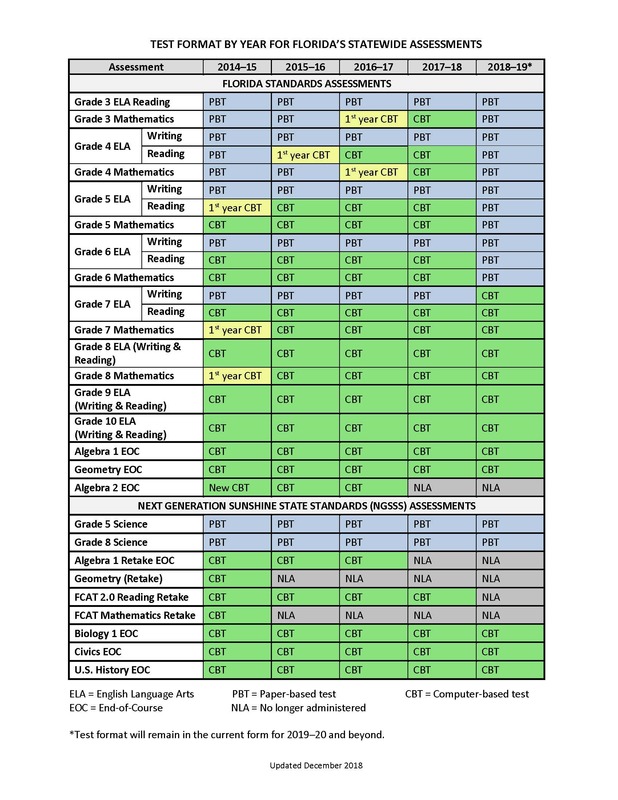 This schedule will show if your child will have a PBT or a CBT. Will my child have a Paper-Based Test or a Computer-Based Test? To understand the difference in how to opt out of one or the other, it’s simple – GO TO THE OPT OUT GUIDE. It’s all there! To see how to opt out of a computer-based test, watch with your kids how Sammy does it… fearlessly! When you refuse the FSA, you are not just saying that you object to how this test affects your child. You are saying so much more. Watch this brief video to see what happens When You Refuse The Tests. And then do the one thing you can do. Deny the data. Opt Out. Retention, Remediation or Poor Class Placement: What’s a parent to do? PARENTS can grant consent – or withhold it. Test scores are in. And the letters are going out. “I am so upset. Please can you help me? My daughter is going into 8th grade and has received Straight A’s in all her advanced classes for 2 years in a row and in 5th grade. She also takes high school courses with A’s. She got a 2 on Reading FSA and now they are telling me she has to take Reading which will remove one of her high school classes in 8th grade. I never want her to take this test again. How do I get her out of Intensive Reading so she can take her high school electives and her Honors Algebra? Since test scores were released a few weeks ago, The Opt Out Florida Network has received many such messages from parents from all over the state, some far more egregious. Remember, you are the parent and the final authority for your child’s education rests with YOU. This is school or district policy, not state law and parents CAN challenge it. Be informed and take action. 1. The child DOES NOT have a reading deficiency, just a low test score. addressed with parents. There is a specific evaluation process that must happen. Don’t let them off the hook. When the school tells you that they have no choice because it’s the law, ask them POLITELY to provide it in writing – the law – the statute – or the district policy. They will not. IT DOES NOT EXIST. For those students with no FSA score because they opted out, there is no actual basis for these decisions, but that is no guarantee that districts and schools will not try to remediate these students – whether out of retaliation or because they are misinformed, it’s still wrong. Someone thinks this is what they are supposed to do. Children’s education is suffering because of this misinformation being passed down from school districts to schools. Without FSA scores, schools should rely on report cards and teacher recommendations for proper placement. It’s summer and you can prepare now by becoming informed. Your child is relying on you to know your stuff. No one else is looking out for them. It’s up to YOU. Informed parents do not need to be afraid or intimidated. Just persistent. Here are some tools that have been proven to work – there is no magic here, just official district or state documents. In the Opt Out movement, these are our “power tools.” Use them to provide your child the education to which they are entitled. Here is a form used in Broward County. Other districts have similar forms, but in case your district tells you they don’t have one, you can use this language from the Broward form in your own email. I can recall no instances where a parent has challenged class placement based on test scores and has not been successful. You may need to be persistent, but you can do it! “I wish to have my child placed in (desired elective) instead of Intensive Reading. I am willing to provide the academic and emotional support my child may need while participating in this course. Thank you very much for your concern. Looking forward to a great school year! Use the information in this post with your child’s school if you need to. Send them the links to the material from the DOE. 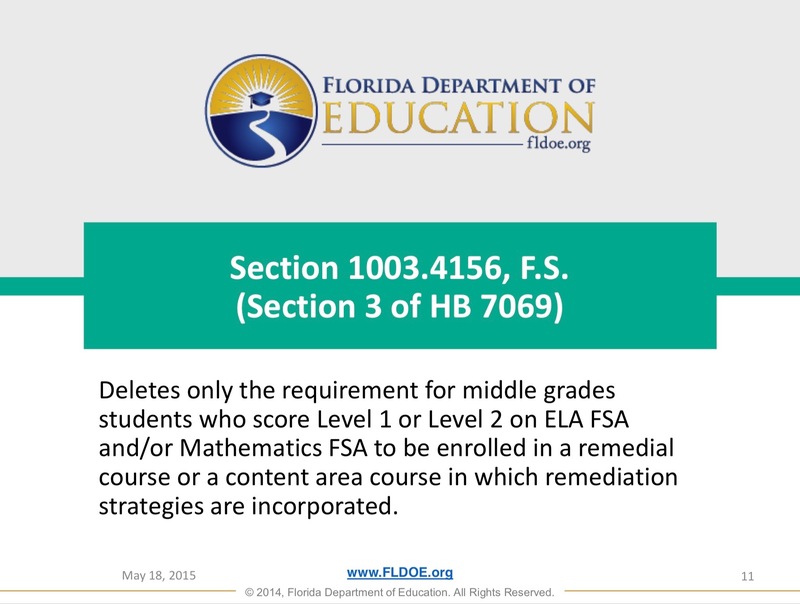 Remediation based on FSA scores has not been a state requirement since 2015 and it has been successfully CHALLENGED many times. “HB 7069… ended the requirement for automatic “intensive” reading or math classes for students who scored below “satisfactory” on the tests, or less than a 3 on the 5-level exams. The Florida Department of Education in a memo today outlined the change for school superintendents. Schools, the memo said, must still provide help to students who struggle on the exams — and that could mean remedial classes. Please read the memo in Resources below. 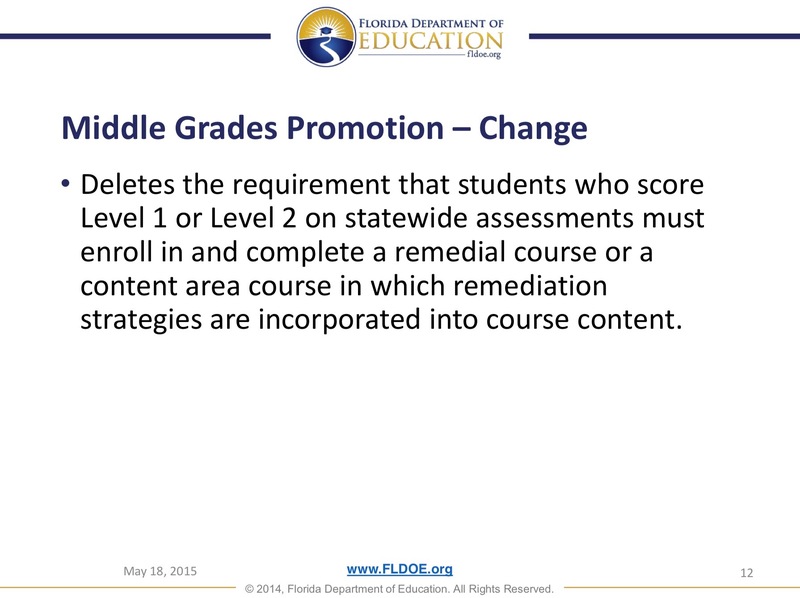 Even for Third Grade promotion, there are Good Cause Exemptions spelled out clearly in the FLDOE’s Promotion to Grade 4 Technical Assistance Paper (TAP) – to avoid retention and to progress without remediation. For more information on avoiding retention, please click here =>>: Third Grade Opt Out Toolbox. Within the Florida education statutes, each school district has some flexibility for how to implement the law. Class placements and student progression are ultimately regulated by your school district’s “Student Progression Plan”. This document is the road map to help you navigate district policy for your child throughout the school year. To be your child’s best advocate, you should familiarize yourself with the information pertinent to your child before school starts back in the fall. To find yours, you can simply search the internet. For more on challenging class placement: Parents, YOU are the Boss… and you can say NO. IMPORTANT – Remember to communicate with your school by e-mail. It is a written record, a timeline and documentation of your efforts to remedy the school’s mistake. Save it. It cannot be deleted by the school and they cannot say they didn’t receive your e-mail. If you use the information provided here and the school is still not cooperating with your request to correct class placement, forward your e-mail correspondence to your school board members and your superintendent and ask for help. CC your local education reporter. Not kidding. One last note – Give the school staff the benefit of the doubt. Most schools are being given incorrect or insufficient information by the districts. Most will never have seen the information you are provided here. Yes, they should know better. Don’t waste your energy “being right.” Provide them the information so that they can do better for your child and move on. Save your energy. We have bigger fights ahead. This misuse of test data, especially when students have a clear record of performing well in school, should be a reminder to all parents that a low test score is always more harmful to children than no test score. All of this underscores just how invalid these tests are, giving no credit to teachers and students for a whole year of hard work teaching and learning. 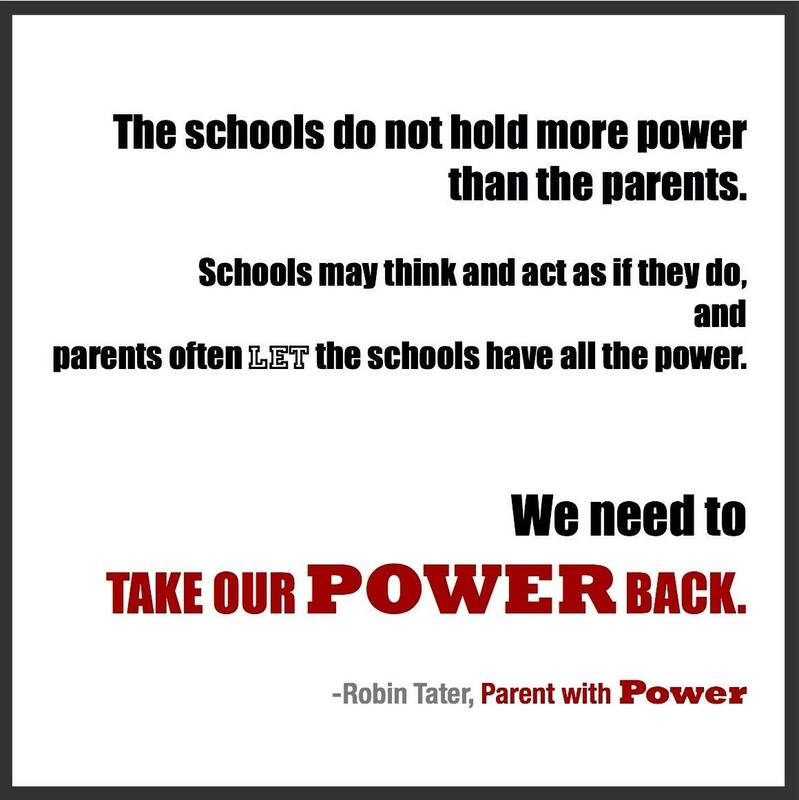 For our public schools to return to common sense, and genuine teaching and learning, parents must stop feeding the testing machine and do the one thing we have the power to do. Deny the data used to harm our children, our teachers and our schools. Opt Out. Please share this information. Someone you know needs it. Testing begins on March 1 and it is more important than ever to deny the data which fuel the attacks on public schools. Be informed. Be involved. Take action. And spread the word. The past year has brought some of the most punitive mandates (HB 7069 – 2017) from the state of Florida, with increasingly blatant attacks on public education. This legislative session is well under way and the actions of Florida’s legislators (HB 7055) promise to further hack away at the ability of our public schools to provide the high quality education to our children, to which they are entitled by Florida law. It is EACH parent’s duty to investigate and to weigh the harm being done to their child’s education by high stakes testing, computerized and dehumanized curriculum, and to understand that it is THEIR choice, whether or not to allow their child to test, and that doing so provides the data with which to rank, sort and label their children and teachers, harming public education for all. This is the current Opt Out Guide for Florida for this year. The information for opting out has not changed significantly from last year to this year. In order to ascertain that you have the most current information, the date of the last update will be indicated at the bottom of this post. What do we know about NR2 and NT codes? It’s hard to believe, but there are still parents out there who don’t know that they can opt out of the tests. Find your local group, connect with your opt out community and let’s keep growing this movement. Knowledge is power. The more parents are informed, the more powerful we ALL can be! If you find this information helpful, remember that it is most POWERFUL when it’s shared! If you are new to this movement, rest assured that you are not alone. Find and join your local opt out group (link below) for information and support, read up and ask questions. Talk to your children’s teachers and talk to other parents. Most of all, TALK TO YOUR CHILDREN – no matter how old or how young they may be – LISTEN to them. Please FOLLOW and keep checking back on this site for more info to help your kids to opt out successfully and to keep you going strong. There is a LOT of information in the links below. Please take the time to read through. You will find many answers to your questions within. Thank you for joining us in this fight for kids and our public schools. IMPORTANT RESOURCES to keep you informed. SHARE. With state testing season beginning this week, FairTest is pleased to offer freshly updated, free fact sheets about opting out. Please circulate widely! Remember… if this was easy, it wouldn’t be called a struggle. 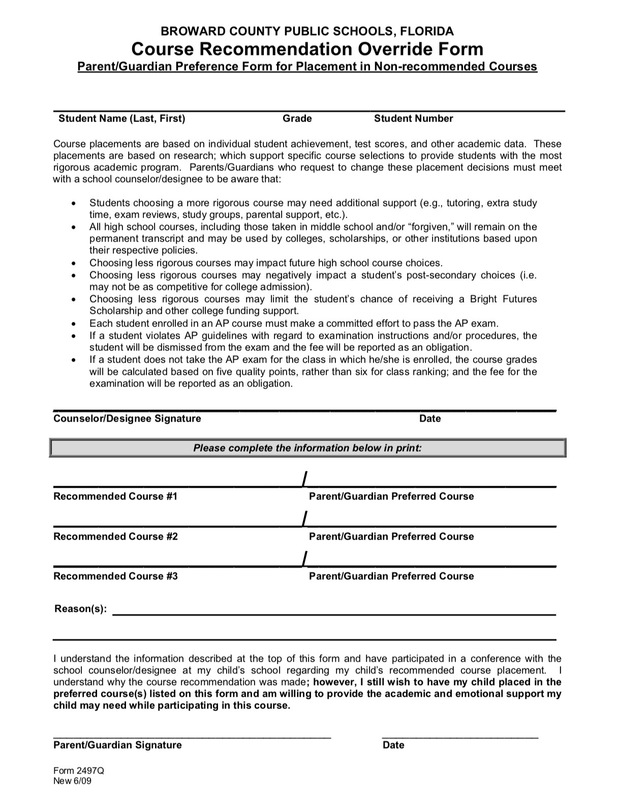 2016-2017 Opt Out Guides are here! Pocket Opt Out Guide for 2016-2017 – the print-and-share version of the complete guide. It’s hard to believe, but there are still parents out there who don’t know that they can opt out of the tests. Knowledge is power. The more parents are informed, the more powerful we ALL can be! Would you print just five or ten copies of this Pocket Opt Out Guide and share in your travels? All of this information may be wonderful for you, but it’s POWERFUL when it’s shared! The holiday season is a time for giving, for sharing and for reflection. 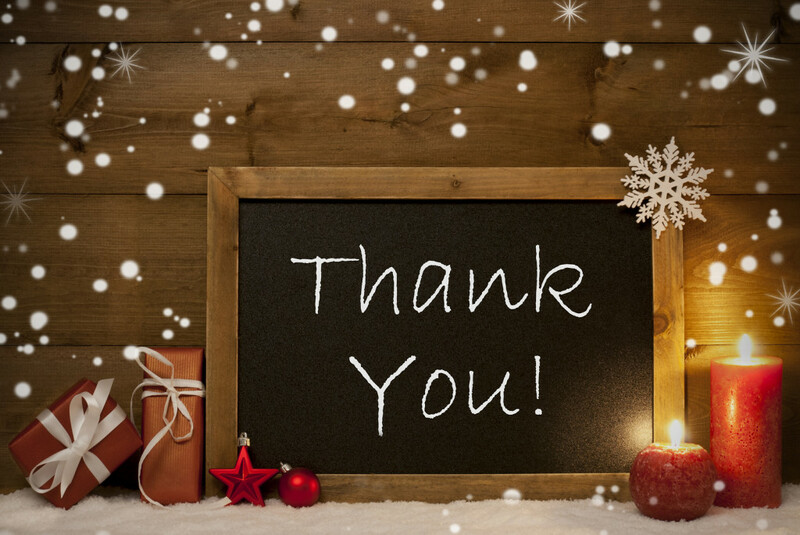 Please join us in acknowledging the MANY volunteers – parents AND teachers – who give of themselves all year long, sacrificing precious time with their families in order to help the public to understand the truth about their rights and options regarding testing in Florida. The Opt Out Florida Network is ALL of these people – from 35 local Opt Out groups all over this state – who stay up night after night after their kids (and significant others) are fast asleep, or after grading papers and planning lessons – reading emails and messages from parents, researching local and national news articles, DOE documents, and state statutes, even reviewing videos of the state legislature and so much more – in order to provide the factual, documented and verifiable information needed to stand up to poor enforcement of policies in OUR public schools. Group administrators lead the way in their communities by moderating discussions in local opt out groups, by sharing information both to and from the district, and by showing up and speaking at Florida Board of Education meetings and local school board meetings. They work with their local teachers’ unions to support teachers by demystifying school district propaganda to teachers about the opt out movement. In other words, they help others to find their voice so that they, too, may speak truth to power. We are parents, students, teachers and former teachers, who share many different perspectives – from different backgrounds, different religions, different customs, different beliefs, and different political persuasions – but we all fight for the same thing – to return our public schools to places of real teaching and learning, where classrooms can be filled with wonder and curiosity and amazing questions – instead of training children how to succeed on a test. So what do we have to be grateful for? The most important growth and change that anyone can experience usually comes out of our most challenging times. It’s easy to be angry and resentful of any harm to our children as a result of poorly implemented policies. It’s harder to keep the bigger picture in mind when we want immediate relief for our children and it isn’t forthcoming. But many of us would admit that were it not for a particular misfortune that befell our children, we would still be blissfully ignorant, even accepting – of testing, of test prep that has taken over our children’s school experience, of poor placement, of promotions denied, and on and on. Being informed can be hard… It’s not easy being “woke.” But it’s far better to be informed, or else we could not call out the monsters by name. We can be grateful that our eyes have been opened to the truth, as distasteful as it is, so that we can fight it. We can be grateful that there are others like us, here and across this country who have joined their voices with ours to fight to stop the testing monster. And we can be grateful for a community of activists, who gather to share experiences and information with the hope that no child will continue to suffer the same. Although things have been quiet, we remain especially grateful to the plaintiff families and their attorneys still embroiled in the 3rd Grade lawsuit, fighting mandatory retention in Hernando, Orange, Osceola, Seminole, and Pasco Counties. The FLDOE and the various districts have an army of 25+ attorneys to defend this lawsuit. It bears repeating that as of last September, only the families who agreed to withdraw from the suit have had their children promoted – contrary to what a FLBOE member recently said in a public meeting. We eagerly await the ruling of the Appellate Court so that the lawsuit can continue in earnest. We remain hopeful for systemic change. In peace and solidarity, with gratitude to each of you, who ARE The Opt Out Florida Network.